The minister was speaking at a briefing on Thursday where Treasury introduced its new SARS Commissioner Edward Kieswetter. Mboweni was commenting on the importance of South Africans paying their taxes, and mentioned e-tolls specifically. "I am very unhappy with the decision by the Sanral board, not to pursue those who have been defaulting on the e-tolls. That is a very bad decision. 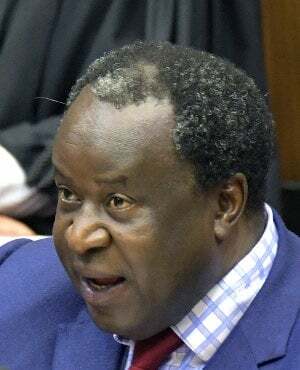 They should never have taken that decision," Mboweni said. News24 on Wednesday reported that Sanral's board would suspend the process of pursuing e-toll debt. Mboweni explained this decision is not helpful for Sanral's ability to raise funds in the bond market and undermines Treasury's stance in the budget that it supports a user-pay principle. "They [the board] must reverse the decision. It has implications for the bond market, it has implications for the fiscus. It has implications for their own credit rating and the credit rating of the country," Mboweni said. He also described the board's decision as "careless" in the middle of a "very difficult" financial situation. "Pay your taxes, render unto Caesar what belongs to Caesar," the minister said. Responding to questions to Fin24 about the impact the decision would have on the road agency's financial situation, a Sanral spokesperson said via email that non-payment of e-tolls had affected its liquidity in recent years. "Any continued non-payment will continue to affect it (liquidity). We have used various mechanisms to deal with the liquidity problem and will continue to explore options." Sanral also emphasised that the suspension was only temporary and that the board is not cancelling e-toll debt. "Should circumstances unfold to return to the option of issuing summonses, the board will reinstate it. The board urges continued and timely payment of e-tolls and e-toll debt," the email read. Sanral assured that its management and government are still working to find a resolution to the impasse on e-toll debt payments. "The president’s office is leading the current engagement with regard to the impasse, with various stakeholders. As Sanral, we have been providing relevant information sought by the president-led process." Last year, Treasury allocated R5.8bn to Sanral specifically because it could not raise funds through e-toll payments. When asked if Sanral would require more funding, given this decision to suspend summonses of e-toll debt, the national road agency said it is and continues to engage with Treasury and the department of transport on its financial status. "Sanral will also continue to explore various other options as we have always been doing." As for its ability to borrow from markets, Sanral admitted a poor e-toll payment rate has compromised its ability to borrow. "Sanral will continue to explain its position to investors as it has been doing all along and the investors will make their decisions thereto."